Authentic Recipes from the Kitchens of Shriya, Nithu & Arthi! This recipe has been long over due to post. I got this recipe from some TV channel show (I totally forgot the show name and channel name) and some professional chef was making it and I wrote it down a while back. I’ve made this recipe couple of times and never got a chance to take pictures. And it tasted really good every time I made it. Finally I got a chance to take pics and posting it here. 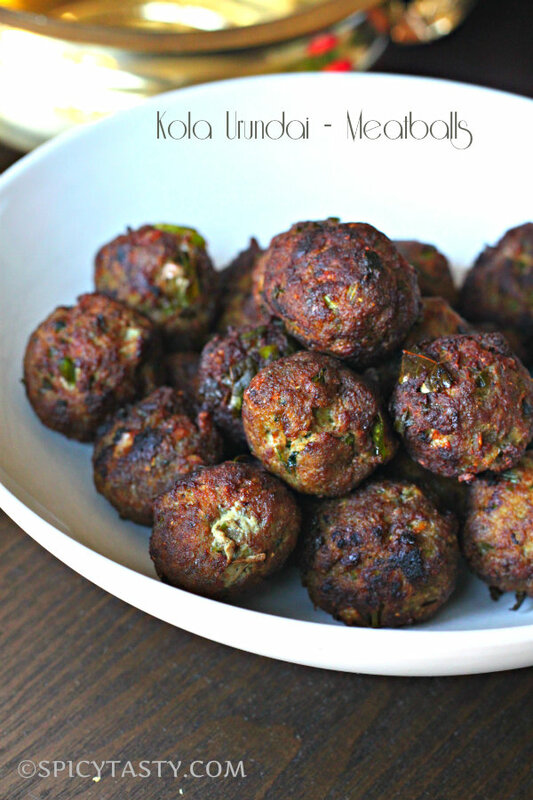 Kola urundai is an authentic Chettinadu (south Indian) dish. It’s deep fried meat balls which is a blend of various spices like cloves, cinnamon, ginger & garlic, cilantro and curry leaves. 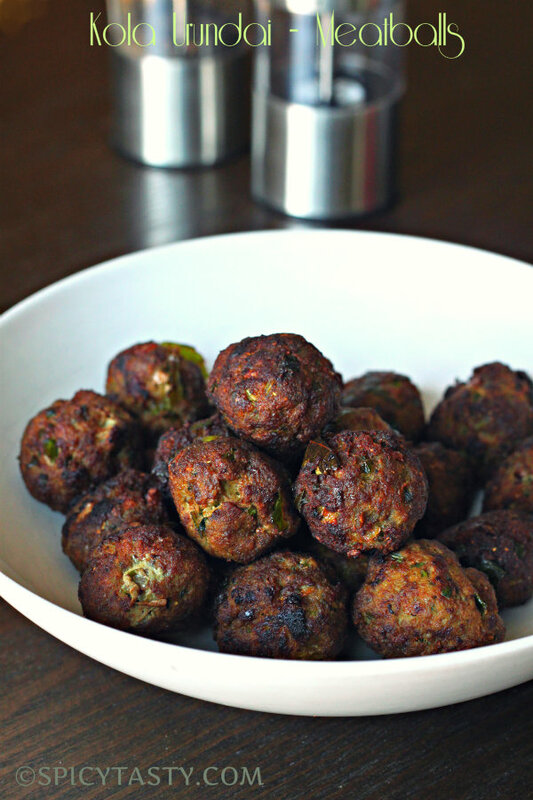 And these balls can be eaten just like that with some sour and spicy sauce as an appetizer or it can be served soaked in a Kuzhambhu called Kola urundai kuzhambhu(recipe for kola urundai kuzhambhu is coming in my next post) with some rice. And it tastes absolutely delicious and heavenly. 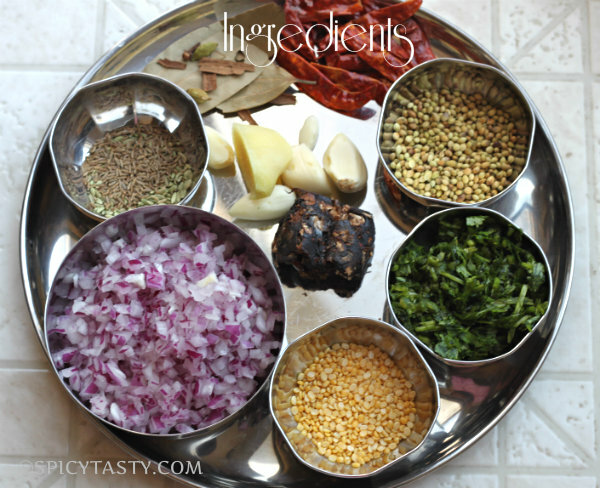 Dry roast all the Ingredients listed under Kola Masala except tamarind and coconut. After that grind all the masalas including tamarind and coconut into a smooth paste as shown in pic. Keep them aside. Now in a mixing bowl add minced meat, chopped onion, turmeric powder, curry leaves, coriander leaves and 3-4 tbsp of kola masala pre prared from the above step and some salt. Mix it all together and make lemon sized balls out of it. 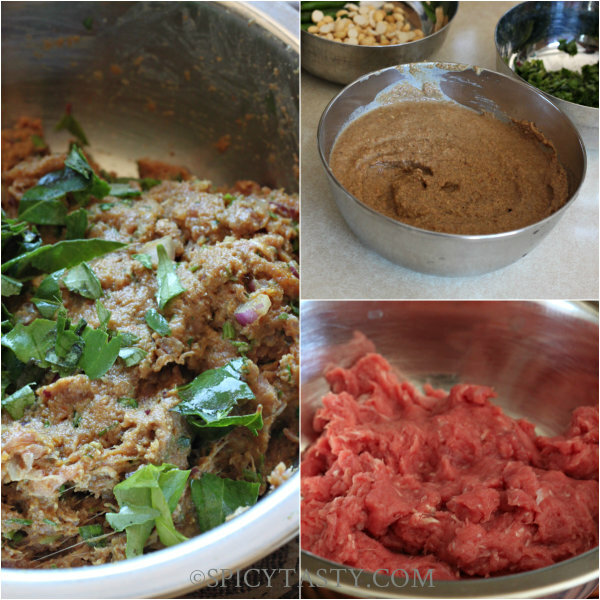 For 1lb of minced mutton you will get roughly about 30-35 balls. 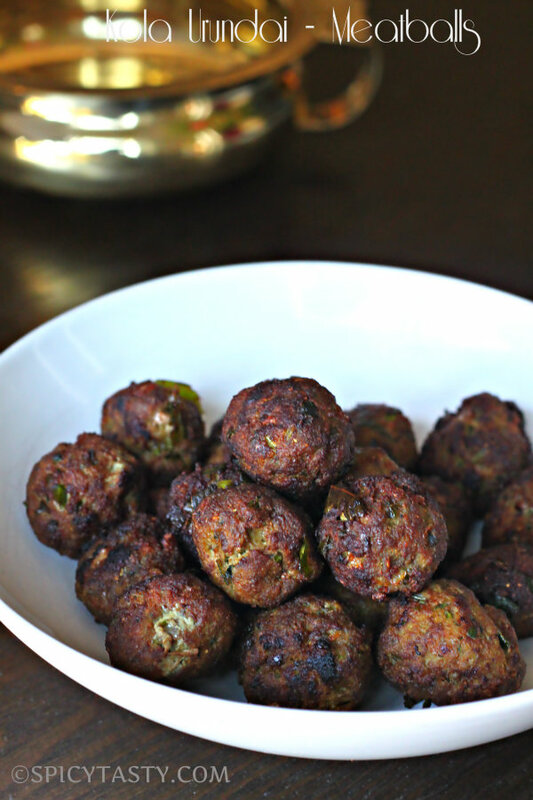 Don’t make bigger sizes because the mutton balls may not get cooked if it is made too big. Now heat oil in a wide pan and carefully drop balls(5-10 at a time) into the oil. Now bring to medium flame and fry till done and it turns nice brown in color. Repeat till all the meatballs are done. Serve it hot or drop the balls into the kola urundai Kuzhambhu. Kola urundai kuzhambhu recipe is coming in next post. Whoa, those are some perfect looking meatballs staring me in the face. Great use of spices – will have to remember this one! Wow looks so perfect, yummy meat balls, my fav too! Great food blogging and droolworthy professional photography with good color ethics…….Got a doubt on the recipe for Kola Urundai…..Usually we use roasted Channa dal(Dahlia, Pottukadalai)for Kola urundai. I haven’t seen that in the ingredient but I could see the picture of Dahlia sitting near the Ground masala along with Green chillies in a bowl. Can you clear if it is included in the recipe or not? Thanks. No I didn’t use Pottukadalai in Kola urundai, instead I’ve used moong dal. I’ve no idea why it’s in that picture, maybe I’ve used it for some other recipe :-). 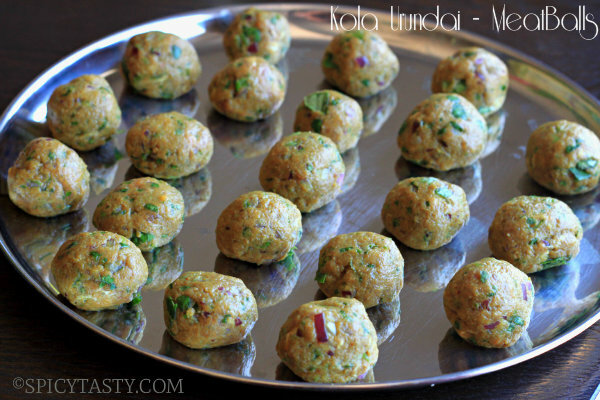 But my mom used to make Kola urundai with Channa dal and it tastes really good. I’ve got this recipe from Cookery show and it tastes really good. Become a Fan on Facebook ! !